Please join us for a live, Master Glass Artisan Lecture SeriesTM entitled "Float Glass with Enamels and Metals" with glass artist and teacher, Richard La Londe on Thursday, April 25, 2019 at 8:00 - 9:00 p.m. Eastern Time, 7:00 - 8:00 p.m. Central, 6:00 - 7:00 p.m. Mountain, and 5:00- 6:00 p.m. Pacific. For our international customers, you may use the following Time Zone Converter. Don't settle for fusing just "clear float glass"
Don't limit yourself to painting to add color. This lecture will be enhanced by Richard's collection of pre-1980s window glass art pieces which are featrued in his book, Richard La Londe and Friends--Book II. This is a unique opportunity to learn and interact with a pioneer in glass fusing! Master Glass Artisan Lecture SeriesTM provide a great way to build interest in stained glass in your unique part of the world. Don’t miss this fabulous opportunity to learn from the glass industry’s best. 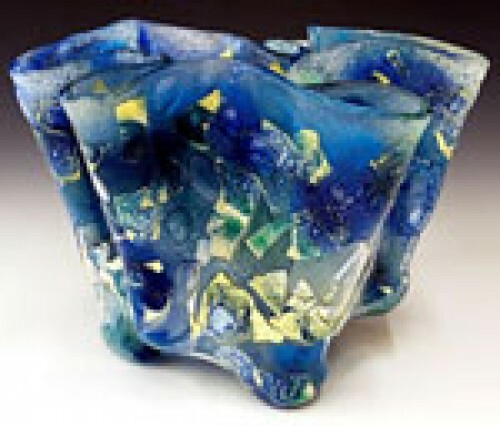 ATTENDING A WEBINAR OR Master Glass Artisan Lecture SeriesTM VIA iPAD OR iPHONE IS NOT POSSIBLE. View with any laptop or desktop computer. Compatible with all Operating Systems.